There seems to be some consensus among conscientious voices in the software community that most new applications undersell what we can really achieve with technology. There is a small crop of startups aiming higher than the rest of the field, tapping into the power of the Web and its mobility to affect social change. In previous articles, we’ve come across apps like MicroHero, which rewards survey respondents by contributing to affiliate charities in lieu of direct rewards or prize draws. When Redditors decided to tap into the power of small contributions from a large group of people, Millionaire Makers was born – a subreddit which attempts to accumulate a million dollars by convincing a million users to part with $1. 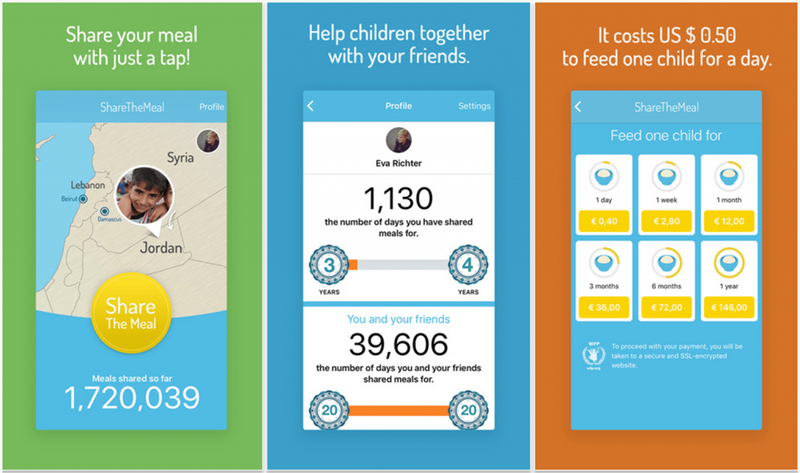 The ShareTheMeal mobile app by the United Nation’s World Food Programme (WFP) works on a similar premise. ShareTheMeal was established as a startup by Sebastian Stricker and Bernhard Kowatsch. It was then absorbed by the WFP. According to data the organization compiled, $0.50 is enough money to pay for a whole day’s worth of food in many countries across the globe. They also found that there are 20 times more smartphones users than there are children who suffer from hunger. The problem until now was for people to find a way to channel small sums of money to a part of the world where it’s worth a lot more. ShareTheMeal makes just that possible. The application has six main options, ranging from paying for a day’s worth of food with half a dollar to a whole year’s worth for $182.50. Payment methods include Credit Card and Paypal. There’s also a social element to the app through which you can share charity efforts with Facebook friends and hopefully encourage others to join in. The WFP takes a cut of 5 cents from every donation to pay for overhead. In its first phase since officially launching last week, ShareTheMeal contributions are being directed to the 20,000 or so Syrian refugees who are part of the school meals program run by the WFP in Jordan. They hope to raise enough to secure a year’s worth of food for the youth population within the programme. So far, things look promising. In its beta test, ShareTheMeal was introduced in Austria, Germany, and Switzerland. The 120,000 users involved in that phase paid for 1.7 million meals in impoverished parts of Lesotho. Currently the app has 100,000+ active users who’ve contributed a million meals already. Given its success to date, the project will soon kick off operations in other parts of the world. We hear a lot about how much computing power we have at our fingertips. Hopefully more developers and startups find ways to to convert the power of a tap into better lives for more than just a few savvy investors. Great to hear. Humans helping other humans is the way it should be. Any time that you can give a little back, even if it is indirect, that is a good thing. Regardless of whether or not I even use an application like this is besides the point. I really like to read about these ventures to help others! Very interesting take on “tech”. This Sharethemeal app seems like a pretty straight forward situation that can be taken care of with an app. Once people see they can donate the full year’s worth of food and that helps so many families, there is a sense of urgency that makes people feel good about it.